Justine had been working out of our San Francisco office all week, so I flew down Friday night to spend the weekend in the City by the Bay. Sadly, the weather ended up being pretty crappy, but we made the best of it and had pretty good time. 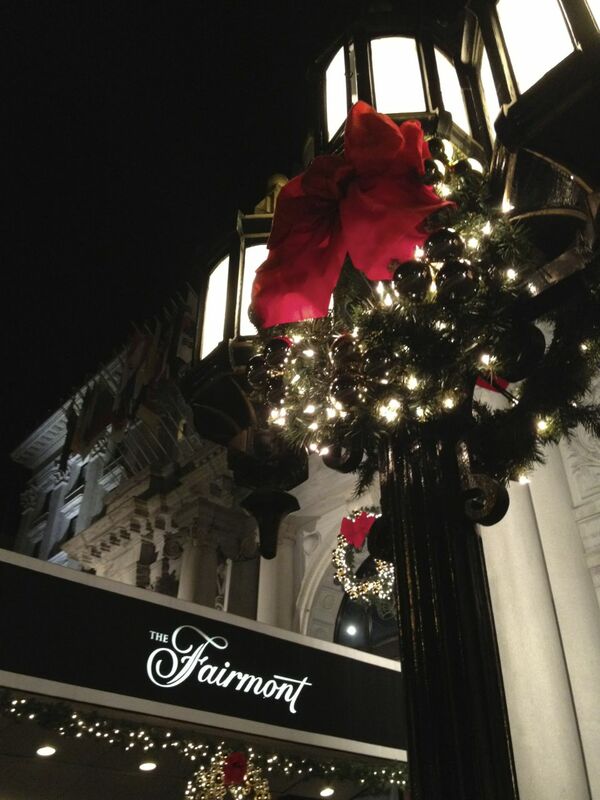 We found a pretty good rate at the Fairmont hotel, which sits up on top of one of the crazy hills in the heart of downtown. Not quite half way between union Square and Fisherman’s Wharf, it seemed like a pretty central location. View from the top of the Fairmont Hotel in San Fran. Friday night, after meeting at the airport and making our way to the hotel, we went out for dinner, then met one of Justine’s new co-workers for drinks. We had a fun night, had some good win and generally had a blast. Saturday morning, we slept in for a bit, then wandered down to Union Square. 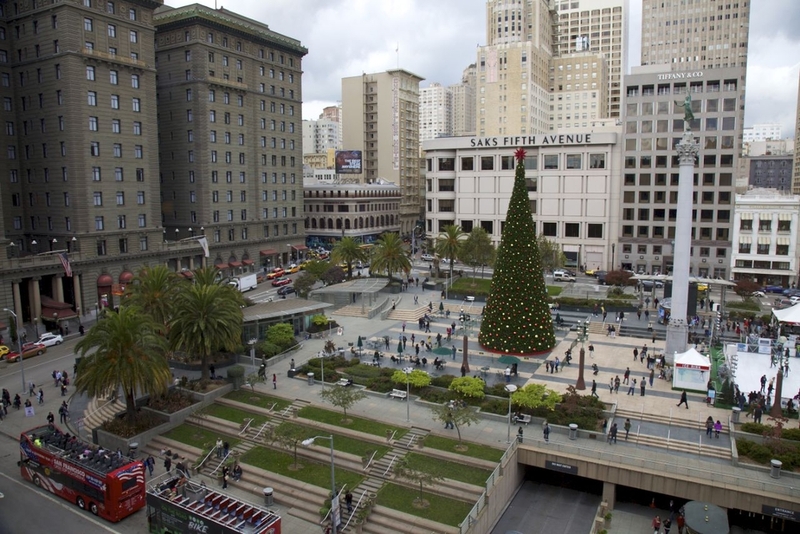 All the Christmas decorations are up, and the square was feeling quite festive. Justine was looking for some new boots, so we did a bit of shopping, before meeting up with our friend Amy, who’s doing a short stint in the Bay area for her job. We had some lunch, got caught up and decided to go check out a college football game that evening. With the wonders of modern cell phone technology at our finger tips, I was able to look up tickets and order them while we had lunch, getting us all prepared for the evening ahead. The view of Union Square from the restaurant at lunch. Justine posing in front of the famous street car. We headed back tot he hotel to change and print out the tickets. A little later, we met Amy back at the train station. 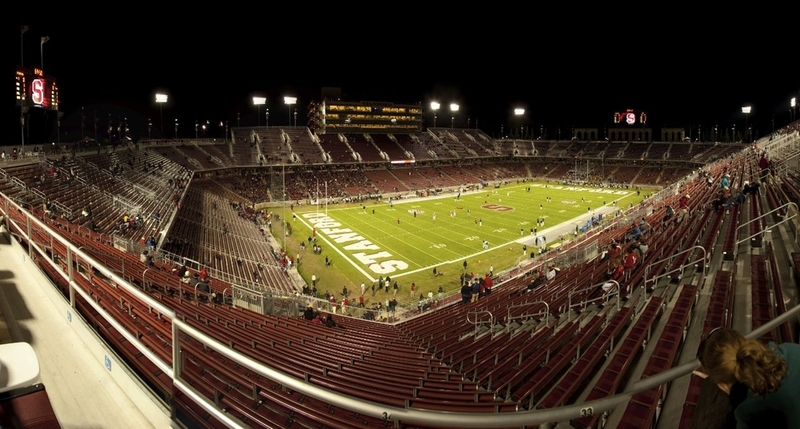 It was about an hours ride out to the Stanford University stadium. 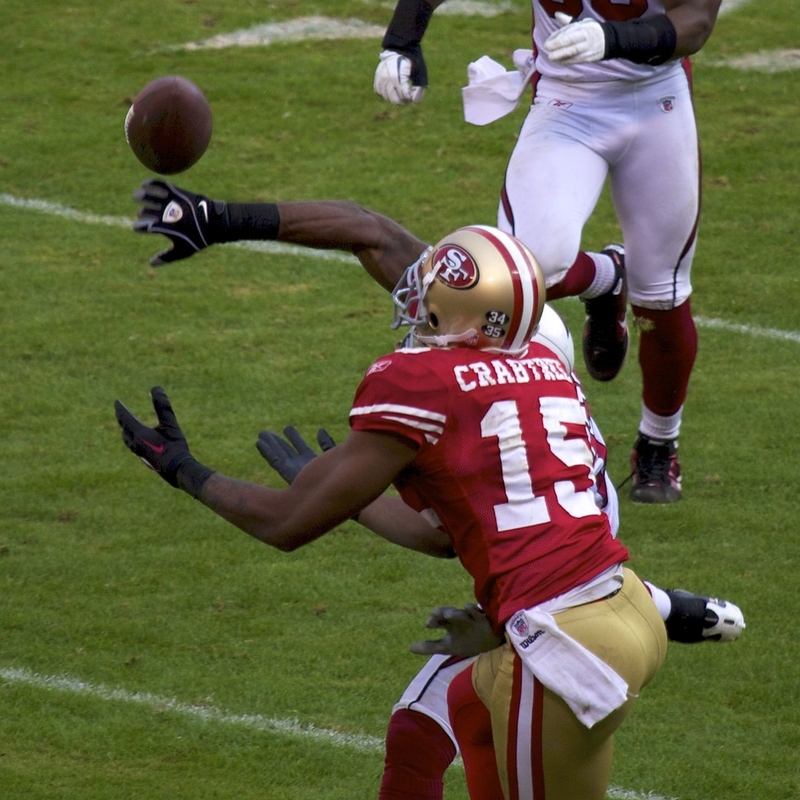 The game in question was actually a pretty significant game, as college football games go. 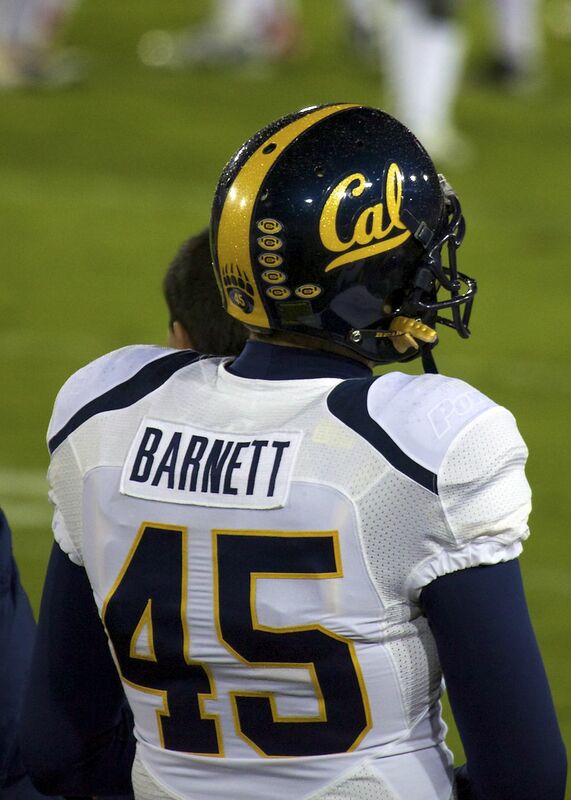 It was a “rivalry” game between Stanford and Cal - the 114th “Big Game”. 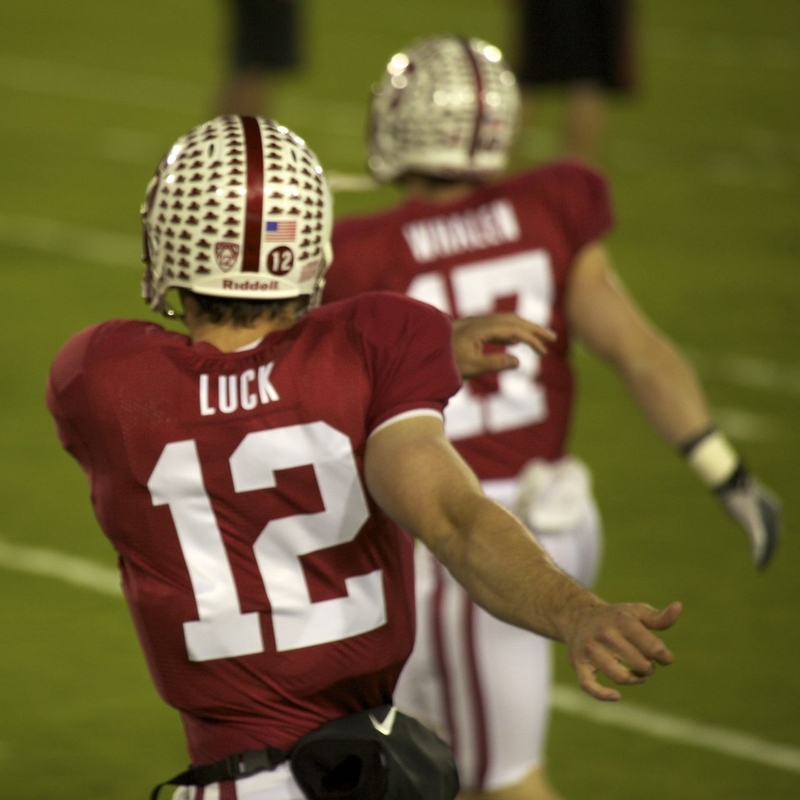 The teams have some history... Stanford this year has also been in the National Championship title picture for most of the year (until they lost a week or so ago...), and they have the #1 ranked player in college football - Andrew Luck, their quarterback. Of course, as we arrived, it began to rain - which none of us were really dressed for, as it had been clear and pretty nice when we left! The game was a lot of fun, despite the rain. 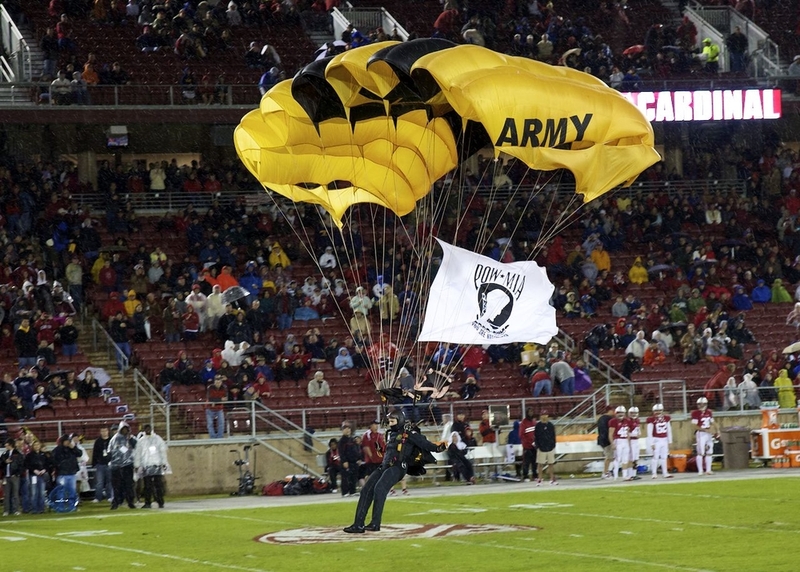 The start was quite dramatic, as the Army parachuted the game ball into the stadium, which was really cool, especially given the conditions. 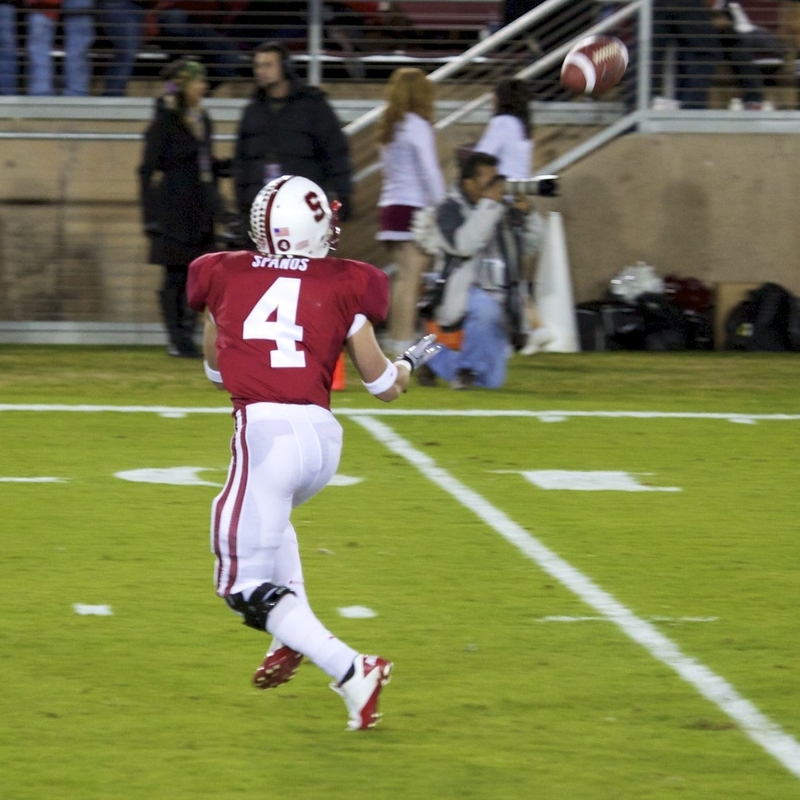 There was lots of action, lots of scoring and Stanford was quite comfortably ahead when we decided to bail, part way through the third quarter. The rain was just too much, and we were a little worried about the rush of people all trying to cram onto the last train back into the city. We lefty Amy at her car, then headed back into the city. While it was still reasonably early, we decided to call it a night. Sunday morning we were up pretty early, as we had tickets booked for a trip out to Alcatraz! Sadly, it was pouring with rain when we got up, and while it did let up a bit by the time we got down to the ferry, it never really stopped the whole time we were there,which put a bit of a damper on the day. The good news is that most of the tour of the prison is inside, so the rain didn’t affect that part too much. It did men that we didn’t really have a chance to wander outside, and so I will need to go back to see it again, and do it properly. Still, it was pretty fascinating to learn about the history of the place, all the things that went on in the prison, and to just see it. I’ve been to San Fran quite a few times, and this was my first trip out to The Rock. Alcatraz and the Golden Gate Bridge. The key, hanging from the rope in the main hallway in Alcatraz. We only had a couple of ours to spend on Alcatraz, as we had tickets for the 49ers/Cardinals game, which started at 1:05 p.m. After taking the ferry back, we had a bit of a hard time finding a taxi (the whole raining thing...), but we made it to the stadium by about 12:30 p.m.
Getting into the stadium was an exercise in stupidity - ridiculous bag policy that made us have to talk to a bunch of different people; scanning with a metal-detector wand; full pat down of everyone entering the stadium. Security measures are out of control, and I can say that until they change some things, I would not go back to a game at that stadium. It’s probably the same at other’s but this whole security theatre nonsense is out of control and needs to be reigned in. Once we dealt with that nonsense, the game itself was a lot of fun. San Fran ran away with it easily, the crowd was very much into it, and we had a good time. Our seats were actually covered, so we got to stay dry and enjoy things a little more than we did the previous night. Still, we left a little bit early in the fourth quarter t avoid the rush - there was no drama about the outcome of the game. Sunday night we went down to the Marina district, by favourite part of town, and we had a fantastic dinner (with a number of excellent beers) at a place called the Tipsy Pig. Cool name, great bar, great food and excellent service. It was a fun night, and a perfect end to our short weekend away.